For this, I started by marinating my diced chicken breast in a mild harissa I made (very very mild, and completely non-authentic, but still tasty enough!). This was made by blitzing up: 2 dried chilis, 1 red bell pepper, 3 cloves garlic, 1 tbsp olive oil, 2 tbsp white wine vinegar and a pinch each of salt, cumin and coriander. The next day, I halved 3 eggplants, and baked them at 375 F for about 15 minutes (cut side down), until softened, but not too soft. I scooped out the middles, leaving four ‘walls’ (which would prevent the chicken falling out later on). I then stir-fried my marinated chicken in coconut oil with diced garlic and onion, before adding sliced mushrooms, kale and fresh basil. 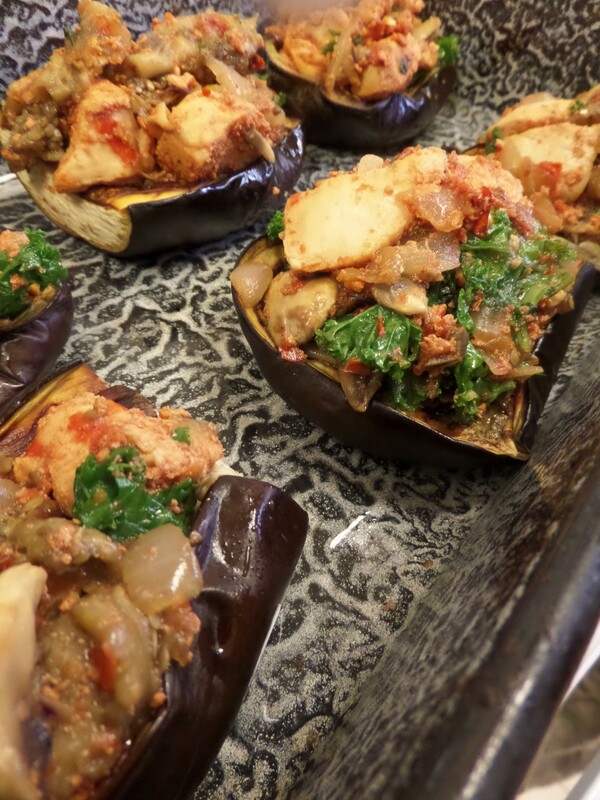 When this was cooked, I filled the eggplant boats and baked for another 15 minutes or so at 375 until hot. Posted in chicken, dinnerTagged basil, chicken, chili, eggplant, garlic, kale, mushrooms, onion, red pepperBookmark the permalink.